Fiction – paperback; Pushkin (Vertigo); 304 pages; 2018. Emma Viskic’s debut novel, Resurrection Bay, is an unconventional slice of noir set in Melbourne, Australia. It’s unconventional because the main character, Caleb Zelic, is profoundly deaf but is such a skilled lip reader that few people realise his inability to hear. It’s also unconventional because it’s not a police procedural as such: when Caleb’s childhood friend, a senior constable, is brutally murdered, he’s determined to track down the killer. He carries out an investigation via the private security firm he runs with his business partner Frankie, a former police detective, who is battling a secret dependence on alcohol. Their work is fast-paced — and dangerous. It swings between the city and Resurrection Bay, Caleb’s home town on the coast, and involves a shady cast of characters, including corrupt cops, thugs and innocent people caught up in a web of lies and secrets. Resurrection Bay is a truly original story. It’s incredibly well plotted and full of twists and turns, but it’s so fast-paced it left me feeling breathless in places. But it’s also very violent. There’s a lot of death and a lot of brutality, perhaps a little too much for my liking. Yet it’s not without gentleness, for Caleb is nursing a broken heart and is still getting over his marriage break up with Kat, an aboriginal artist, who is unwittingly caught up in Caleb and Frankie’s investigation. If I was to fault the story it would be that sometimes it feels unrealistic, but this is a minor quibble, because the tale is so gripping it hardly matters. Caleb, of course, is the star of the show, a convincing protagonist, appealing and likeable. And the twist at the end caught me off guard, which is always the sign of a great crime thriller. 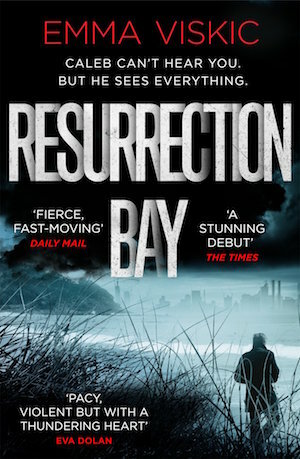 Resurrection Bay has been shortlisted for two prestigious CWA awards — the Gold Dagger and the New Blood Dagger — but it’s also won a slew of awards in Australia, including the Ned Kelly Best Debut and iBooks Australia Best Crime Novel. This is my 14th book for #AWW2018 and my 11th book for #20booksofsummer. I bought it when it came out in paperback earlier this year because I’d heard good things about it. Nice review. I really liked this book too. I liked it but not sure I’m interested enough to continue with the series. Have you read the follow up? I wasn’t wowed by this one. I found the plot a bit convoluted and frankly dull! I wasn’t convinced about Caleb’s motives for becoming a PI either. What a great premise – I like the sound of this one.